Congrats to my winner, jakiesmom ! Earlier today I posted a review of my new necklace from Cymbaline's Designs. Now she's generously letting me give away one piece of jewelry from her shop to one of you!!! Visit Cymbaline's Designs and let me know in a comment what piece of jewelry you like best. US/Canada mailing addresses only, please. 2) Enter my other giveaways- leave a separate comment here for each one you enter. 3) Put my button (code on the right side of the page) on your blog- let me know where I can find it. 4) Make Cymbaline's Designs one of your favorite shops on Etsy. 5) 5 extra entries (leave 5 separate comments) Buy something from Cymbaline's Designs during this giveaway! Giveaway will end at about 9 PM on November 4, 2009. I will choose a winner via random.org and will send an email. Winner will have 48 hours to respond. I LOVE the Emerald Isle Posy Necklace! I entered slim perfect swimwear! I entered Print My Baby! I entered smartmom teething bling! I want to check out her shop but it says she's away?! Her shop remains to be closed, so I went to your review. The bluebell lariat necklace is what I adore most! How stunning!! I love Caribbean Cluster Bouquet Lariat Necklace. The button is to dine on the page. The Blushing Posy Necklace is gorgeous! I love the Stormy Flutterfly Necklace. LOVE LOVE LOVE the Midnight Wasabis earrings! I added this seller to my favs under FotoMacro. I would pick the Wine Lily Earrings for my wife. I have added this Etsy seller to my list of favorites on Etsy under RePurrPussed. I would love the By the Light of the Moon Necklace. So pretty! My fave is the Glamorous Posy Necklace. So pretty! I like the champagne and posy necklace. I entered your swimsuit contest. I love the dangling blue flower earrings! I added her as a favorite on Etsy! I like the night on the town necklace. entered the pring my baby giveaway. entered the stay with me socks giveaway. entered the zoom photo giveaway. I like the Stormy skies posey! Oh, I LOVE the peppermint posy necklace. So pretty! The Midnight Wasabi Gunmetal earrings are my fave! Thanks! I added Cymbaline as a fave. I love the Stormy Skies Necklace. I like the Stormy Skies Posy Necklace. 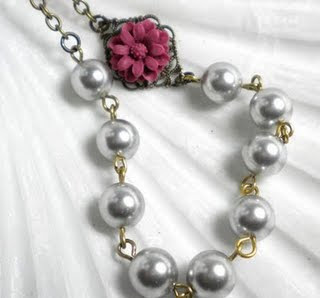 Love the Rosy Posy Necklace. Because they are adorable and can be used for many outfits. LOVE that idea. I have your button on my blog, jummping on trampolines. I can't make up my mind between the midnight pearls in pink or sky midnight pearls in blue! both earrings are so pretty! Midnight Posy Necklace is my fav!